This modern fragrance Adidas Team Force is full of energy and freshness. Adidas Team Force 100ml. Eau De Toilette is a great fragrance, fresh citrus for men. It is designed for all men who are determined to live every day of their lives to the fullest. This modern fragrance, Team Force, is full of energy and freshness. It will turn your reliable partner not only in seminars or sports activities during the day, but the evening, at a party, you will increase your natural charisma. Adidas Team Force scent opens with accords unique and unmistakable refreshing pineapple, grapefruit delicious mandarin orange and captivating. Captivating notes of juniper central aromatic ring hide and soft jasmine. Conclusion fragrance is composed of amber, cedar, sandalwood charming, seductive and sensual musk tobacco. This fragrance for men, Adidas can be worn in any situation. Recharge your energy and envelop yourself in perfume for men, reliable and refined, Adidas Team Force! Fragrances for men or women 100ml by Adidas were launched in 2000. This designer fragrance is a flowery blend of flowery aromas. 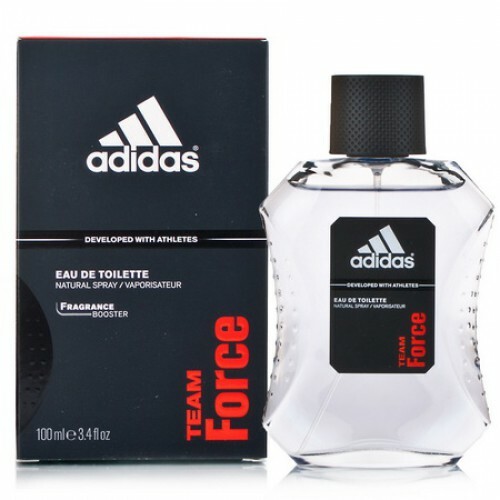 Adidas Team Force colognes for men by Adidas fragrances are recommended for daytime wear. Knowing all about sports and sports life, Adidas assembles a team of like-minded people. For those who love to play and win, and above all appreciate the cohesion in the team, he created Team Force - aroma of real winners! They know how to turn an ordinary person into a professional athlete, from novice to do a rising star sports and nurture future champion. Together with Team Force you feel the team captain, ready to lead people to new victories!